There are many little tasks and actions SEOs must do on a daily basis. Some of them can be done quickly but many are a little tedious and repetitive. 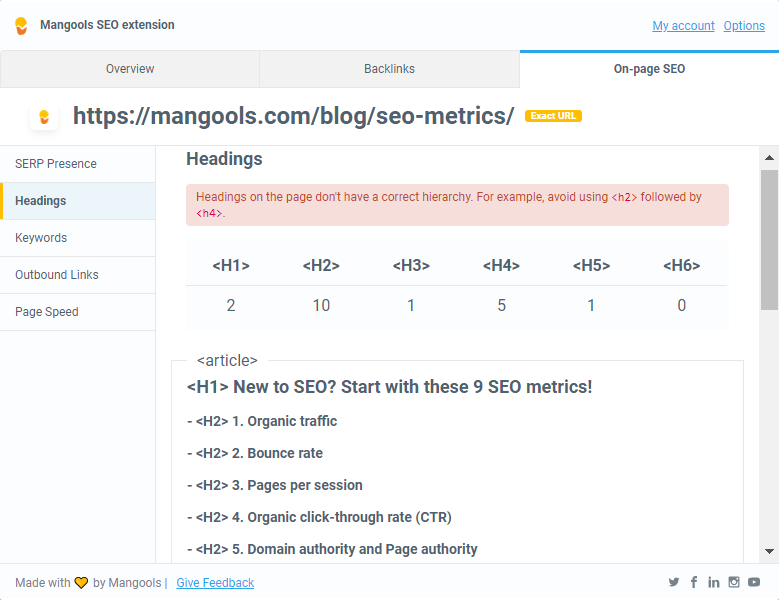 The main goal of the SEO extension by Mangools is to make some of these tasks easier by simplifying the process as much as possible and bringing many small SEO tools (whether it is a tool to check SEO metrics, word count, keyword density or dofollow/nofollow links) under one roof. 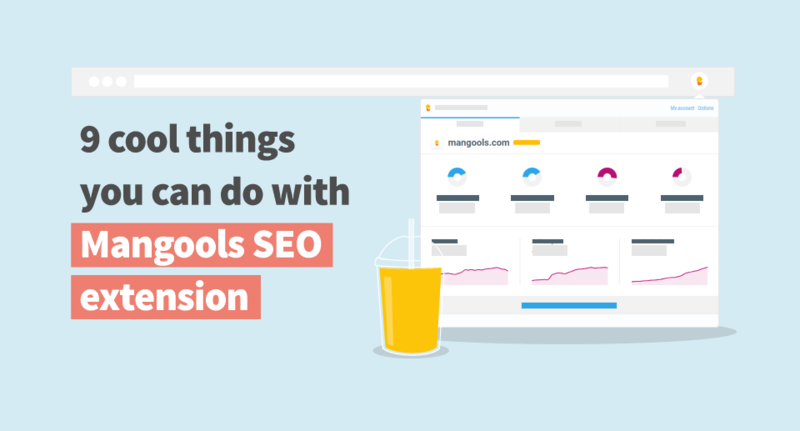 There are many cases when you need to check the basic SEO metrics of a website… The first main tab of Mangools SEO extension serves exactly this purpose. I use this feature on a daily basis to quickly check the authority of the website when looking for the prospects for guest posting. Domain overview is also my first visit when evaluating the overall authority of any competitor. 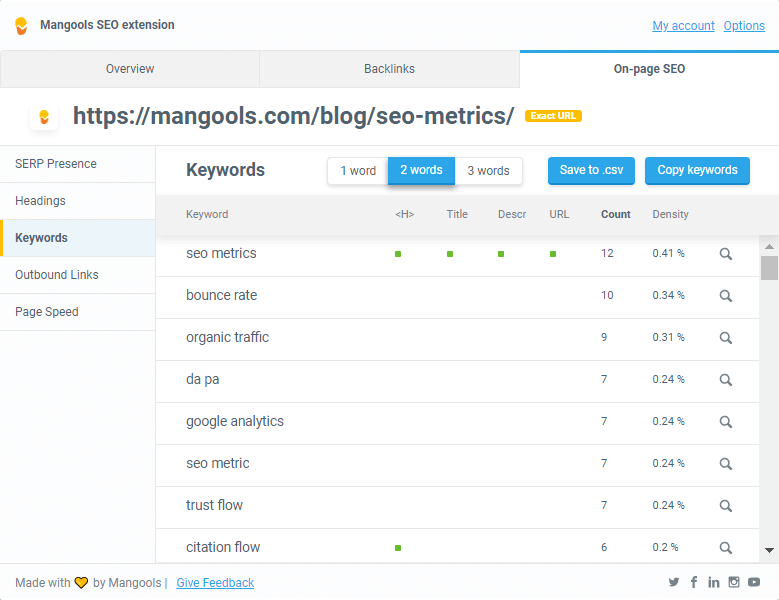 It gives you a basic overview of the website authority, thanks to the metrics by Moz (Domain Authority and Page Authority) and Majestic (Citation Flow and Trust Flow). In the second row, you can see Alexa rank (website popularity based on the estimated number of website visits), number of referring IPs and number of Facebook shares, together with the trend graphs. All the metrics look at the website from different points of view so that you have the best idea about its popularity and authority. Tip: In the extension options, you can select the default input type (root domain or exact URL) that will be used when you open the extension. Another convenient feature is the option to check the data of any link on a page by using the right click and opening the linked page or domain in SiteProfiler for detailed analysis. 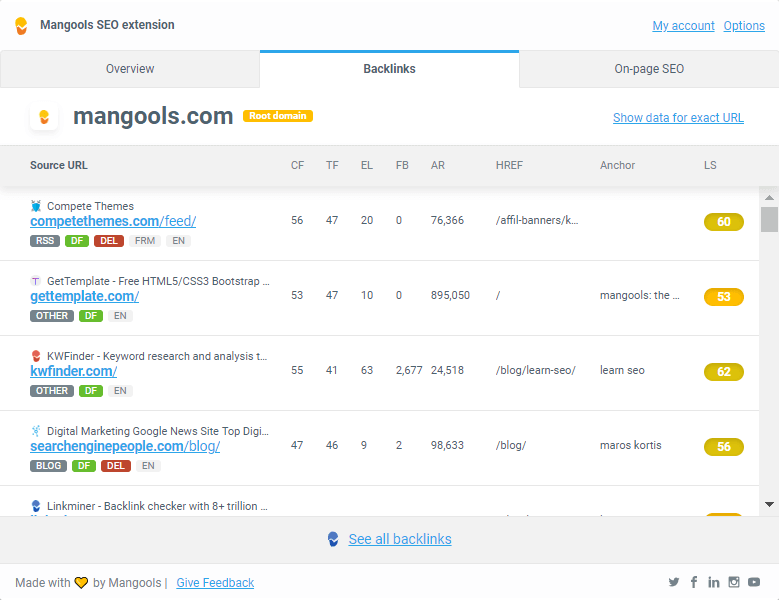 The second tab in the SEO extension by Mangools is dedicated to backlinks. Again, the extension offers a quick switch between the backlinks to a domain and the ones to the exact URL. Well, backlinks are one of the core ranking factors, so anyone doing SEO is in direct contact with them in one way or the other. I use the second tab of the extension every time I need to check what kind of backlinks does the page have. After that, I go to LinkMiner for detailed backlink analysis. 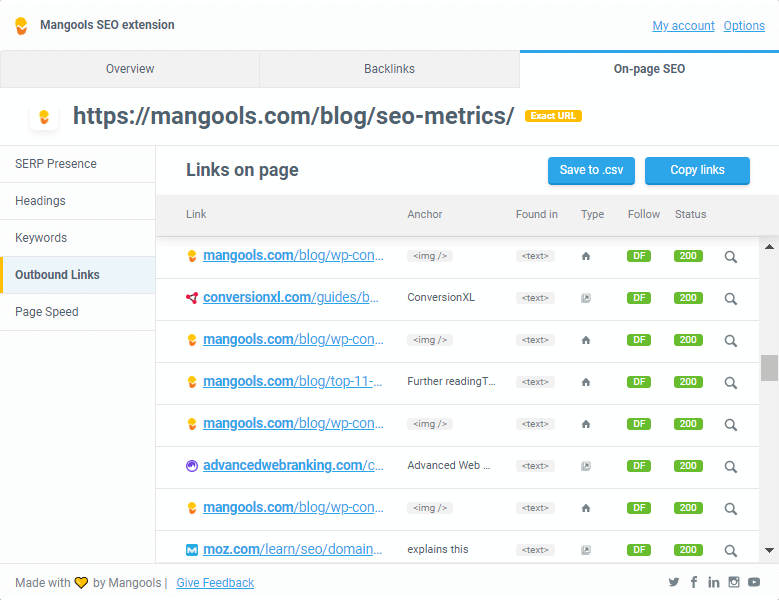 You can find the best backlinks and see the linking URL, dofollow/nofollow attribute, Citation Flow, Trust Flow, number of external links, number of Facebook shares and Alexa rank. Besides that, you can check the anchor text and the most important metric – Link Strength based on several factors that will help you to estimate the power of the backlinks quickly. Tip: Right click on any link on a page will allow you to check the backlinks pointing to that particular link or domain. Through the link at the bottom, you can go to Linkminer to access more backlinks, live previews of the linking pages and filtering options, including the option to see only the dofollow links or active links. 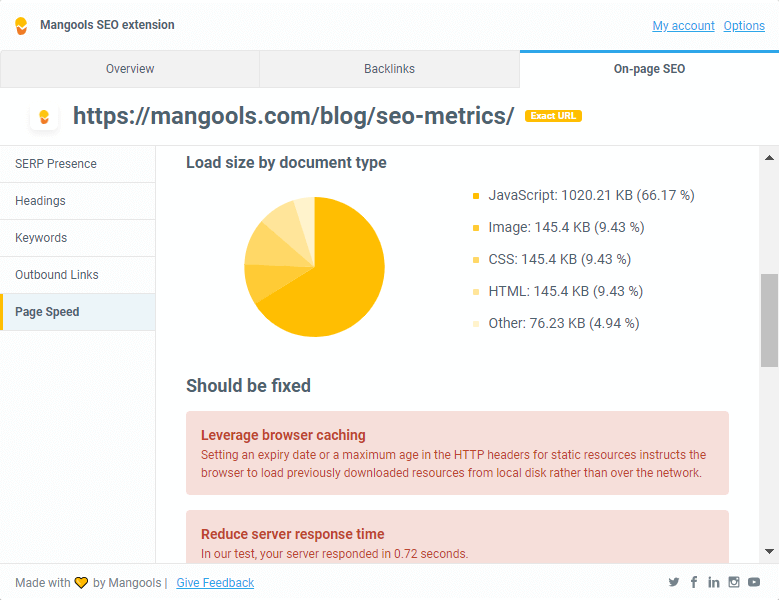 The third main tab of Mangools SEO extension is dedicated to an on-page SEO analysis. It is divided into five sections and the first is called “SERP presence”. Most commonly, I use this section to get inspired by the meta tags of pages that rank successfully for a keyword. Of course, you can also use it as a quick check of your own meta title and meta description to fine-tune your SERP snippet to perfection. The keyword density checker is a useful feature that cannot miss in any on-page SEO analysis tool. You can filter the keywords by the number of words (1, 2 or 3-word keywords) and see their placement (title, URL, meta), word count and density percentage. One of the purposes of keyword density checker is to analyze your competitor’s articles to reveal the target keyword they used. Of course, you can also check your own articles to see whether the keyword you want to rank for is placed correctly on the page and whether it appears on the page often enough. Keyword density is a controversial topic in the SEO world. Although most SEO experts say that the whole “ideal keyword density” concept is a myth, there are still many people that will claim that this or that percentage is the only right ratio. 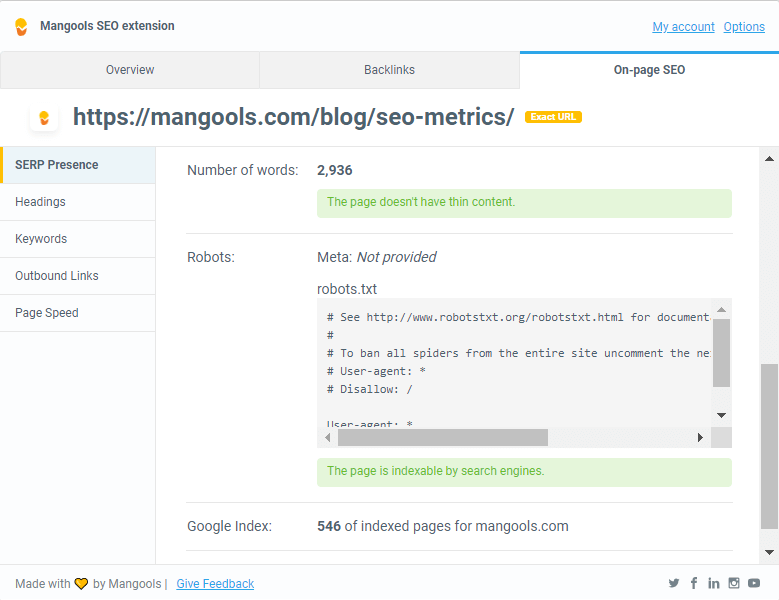 Another feature of the on-page SEO analysis in the extension helps you to analyze all the outbound links (links that point FROM a page). Besides showing the anchor text, link placement and dofollow/nofollow attribute, you can also see the http response status and export all the data to CSV. The outbound link analysis is super useful for finding broken link building opportunities. All you need to do is to find a relevant page you would like a backlink from and check whether it’s pointing to any 404 page. The webmasters are much more willing to replace a link that is not working with your link than just adding a new link in general. When Google introduced rel=”nofollow” attribute back in 2005, it was a significant change in the world of search engine optimization. It definitely helped to solve the problem with spammy backlinks from comments as it blocked the passing of link equity via these links. 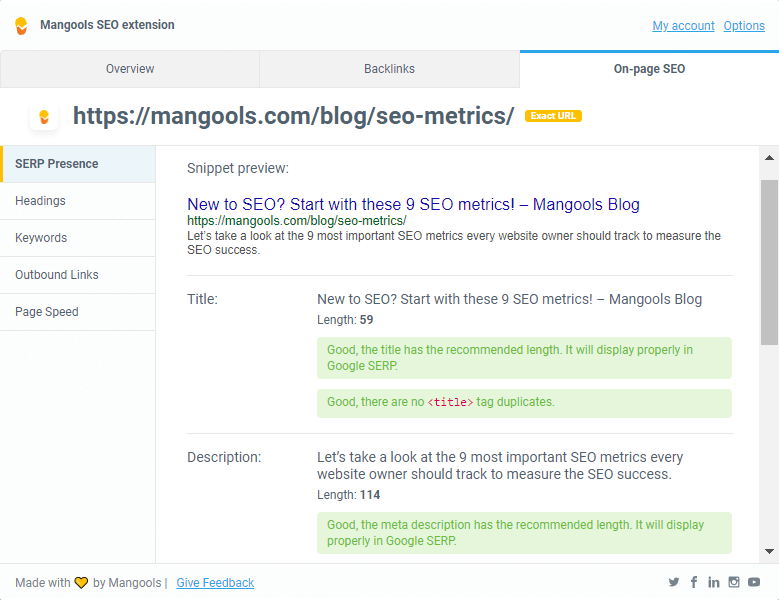 On the other hand, it added one more thing for the SEOs to check when doing the link building campaign. When looking for the guest post opportunities or the possible prospects in a link building campaign, it is important to notice whether the website uses dofollow or nofollow link attributes. This feature will make it very easy. Everyone knows that the page speed is crucial in the SEO world – it’s a ranking factor and it contributes to the good user experience in a significant way. In other words, if your website is too slow, it may rank worse and people will leave it earlier. 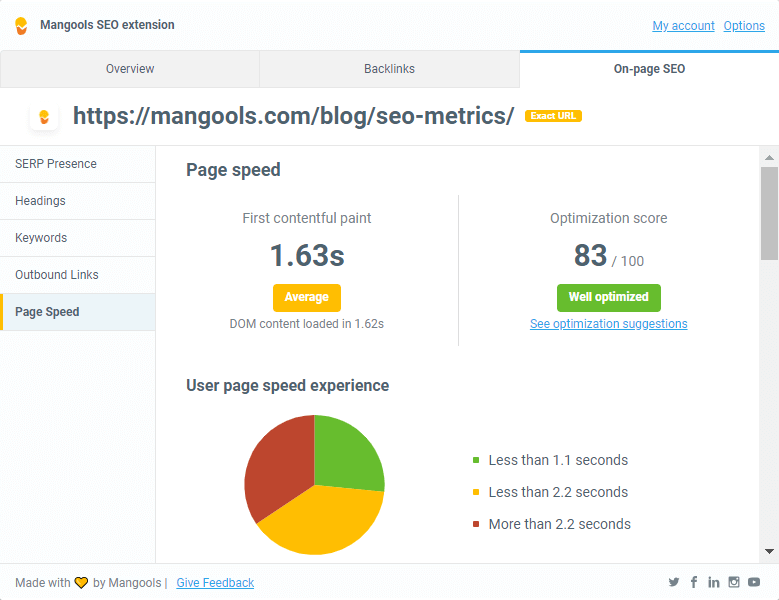 Not only can you check the page speed of the currently visited website and optimization score (on a scale from 1 to 100), the extension will also provide useful optimization tips to improve the page speed of the site. I also use this feature to compare the performance with my competitor’s website. Tip: The first contentful paint is based on the real data from the Google Chrome users. It is an important milestone as it states that the page started to load. This handy feature allows you to check the structure of the headings on any page you visit in your browser and spot possible structure errors (for example an H4 heading following an H2 heading). 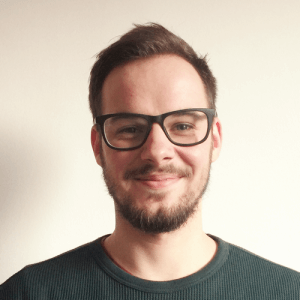 I use this feature when I want to check whether the structure of the blog post I wrote makes sense and to make sure that the headings are placed correctly in order to make the site easy to understand for Google crawler. 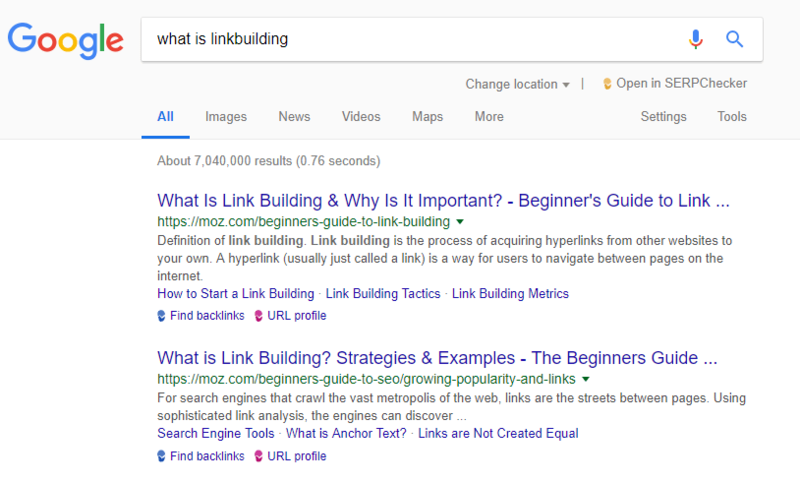 It can be very useful tool when striving for a bulleted featured snippet for example. The correct hierarchy of the H1 – H6 headings is very important as search engines use them to understand the structure of the text on a page better. Many people tend to ignore the fact that H1 – H6 headings are not a way to format the font-size of the headings, but semantic tags in the first place. The extension comes with convenient shortcuts to our tools SiteProfiler, LinkMiner and SERPChecker directly in the SERP results. You can analyze the website or its link profile by clicking on the logo of the respective tool. Tip: The enhanced SERP features can be easily enabled or disabled in the extension options. You can change the location of the search directly from the SERP results too – all you need to do is to select the desired location below the search bar and the corresponding SERP will be open in SERPChecker. 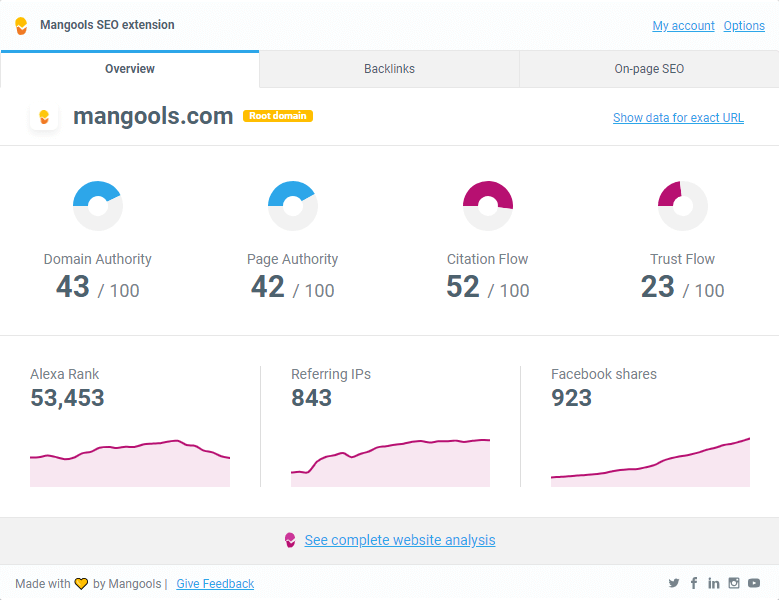 If you like the features of Mangools SEO extension, you can download it for free in Google Chrome Store or Firefox Add-ons. Are you missing any feature? Is there a use case we forgot to mention? Feel free to let us know in the comments!